World Premiere of Sea-Fever Cinema! Welcome to Sea-Fever Cinema, the latest exciting feature of the Sea-Fever blog. Allright “cinema” might be overstating things. Over in the left column you will find a new widget which will have three new videos every few weeks that will explore the same topics I write about in the blog. The first installment of videos cover a wide range of maritime topics. As a young boy I often dreamed of being a tugboat captain and this McAllister Towing promotion video of the move of the USS Intrepid is pretty cool. The next video is one of my favorite sail training videos and I wrote about it on my old blog Tall Ships Today! over at the American Sail Training Association. The final video about maritime security I stumbled upon soon after an exchange over at The Tabor Boy Project with a former shipmate who is currently onboard a Military Sealift Command ship. Breakout the Cracker Jack and enjoy the show! Posted on April 28, 2007 April 28, 2007 Author Peter A. MelloCategories new media, storytellingLeave a comment on World Premiere of Sea-Fever Cinema! The natural order of things calls for change and renewal from time to time. The old is replaced by the new but tradition still carries on. At least that is the case with sail training and tall ships. Over the past few days there have been several interesting stories in the media about the rich history and the promising future of sail training. First on Saturday there will be an auction of a collection belonging to Captain Arthur Kimberly, former owner and “skipper” of the storied Brigantine Romance. You can read the Monroe News article about the auction here. Romance was our only home from 1966 to 1989. Together we sailed extensively through the South Pacific, and twice around the world. She carried stuns’ls –the extra wings of the clipper ship era, as she does in the photo above–for 26 straight days crossing the South Atlantic in 1977, a modern record which may never be broken. Her Caribbean cruises gave thousands a chance, if they wished, to “pull braces” before the mast in square rig. She made boys into men; Masters and Mates of many of today’s sailing vessels. They are her finest legacy. Check out the guest / crew list where you’ll find a number of industry leaders like Captain Dan Moreland of the Barque Picton Castle, Bert Rogers, executive director of Ocean Classroom Foundation and other who continue the tradition of changing lives at sea under sail. Over the past few days there have also been a number of articles in the Charleston Post & Courier about the new sail training vessel Spirit of South Carolina. This has been a very exciting project to watch, especially over the past few years with the arrival of the dynamic team of Brad and Meaghan Van Liew. You may recognize Brad as a past winner of the Around Alone Race. The Van Liews have energized a project by raising much needed funds, finishing construction of a beautiful vessel, assembling a strong team of professional sailors and educators, and communicating a compelling vision to their community. The Palmetto state is lucky to have a finest kind vessel with world class leadership. Finally, I launched The Tabor Boy Project a little over a week ago with very little promotion and no real expectations. Well, it is developing into a very interesting website. There are a few stories and some great photos and I am sure that more are on the way. One of the most interesting things is that The Tabor Boy Project currently has members from the Class of 1962 to the Class of 2008! 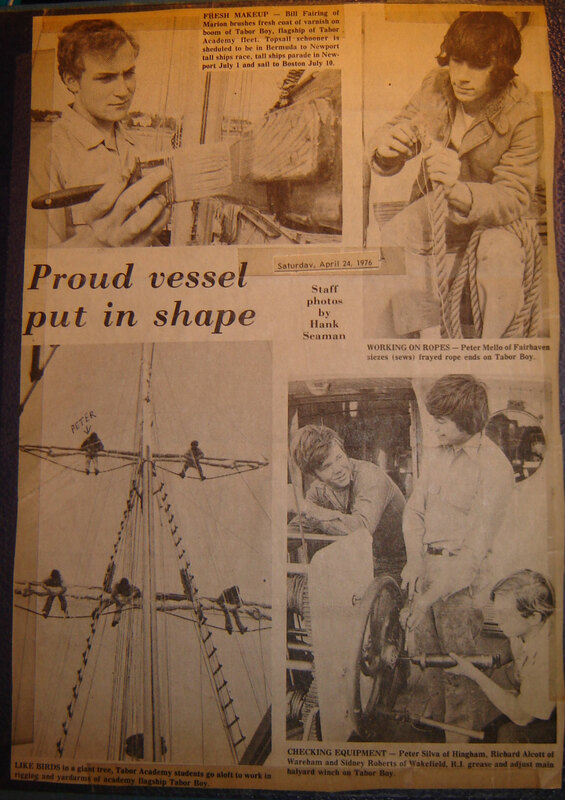 That nearly half a century of life changing sail training experiences! As the site develops and additional stories are told, we’ll learn more about Tabor Boy, sail training and maybe even ourselves. The column provides the Friends of the Maritime Museum perspective and highlights the challenges engendered in public private partnerships. Most importantly, it also demonstrates what a dedicated and passionate group of individuals can do to advance a cause in a community. Building a strong cultural institution is a collaborative affair. It requires vision, commitment and hard work from diverse interests, all of which the Friends thankfully seem to have in spades. NY Times photo by Fred R. Conrad. Check out the great side show today over at the NY Times website. We rarely get the opportunity to get an inside look at what makes a maritime heritage event succeed or fail; however, last week the State of North Carolina published a Special Review of last summer’s Pepsi America’s Sail. (download pdf copy) It makes very interesting reading. I previously wrote about this here and here. The majority of the report involves a land transfer that generated some confusion and controversy. The report also includes the responses from a number of interested parties including the Friends of the Museum who since their founding in 1979 appear to be a significant contributor to the growth and success of the North Carolina Maritime Museum.